Earlier this week we went to a Sesame Street celebration at one of the museums. My nanny kids have very limited screen time, so Goldilocks (2) only recognized a few of the Muppet characters, but they had storytimes, a singalong, and art projects which I knew she'd love. 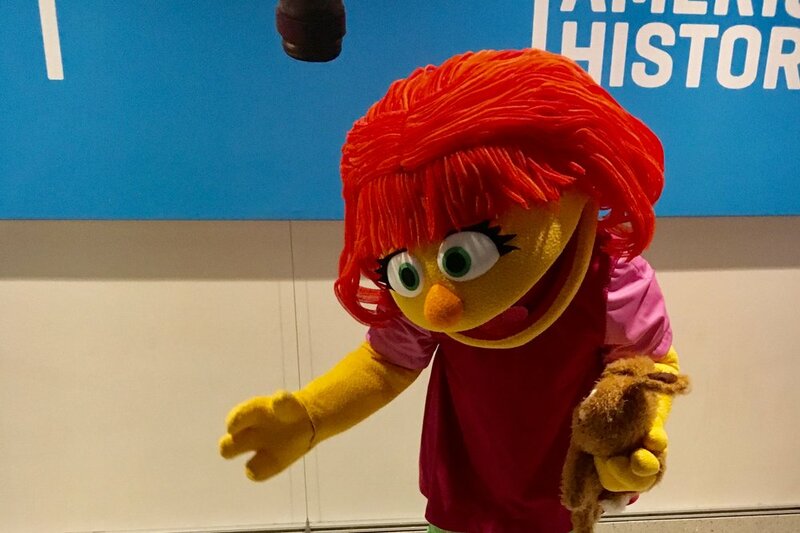 The new Sesame Street muppet, Julia, was also there taking pictures with kids. I'm not inclined toward costumed character meet and greets with little kids - they're more often scary than exciting, and I certainly wasn't planning on keeping Goldilocks standing in a long line for a 15 second photo op today, but she was adamant. She didn't want to go play, she didn't want to keep drawing, she wanted to give Julia a hug. We waited and as we got closer, Goldilocks could hardly contain herself with excitement. She marched right up and gave Julia a big hug while the kind museum staff snapped photos. Later that day, she was thrilled to tell her parents about her new friend Julia! I still won't push her to sit on Santa's lap or pose with a costumed character if it comes up again, but on that day she felt ready, she told me so clearly, and she achieved her goal.